Every time I go shopping with my girlfriends and pass by a bedding supply store, I stop and stare at the beautiful bedding arrangements a full 10 minutes, dreaming about my future home and possible bedroom. Sometimes, I'm willing to spend more than 10 minutes window shopping at those stores especially when I have time by my side, because I like "studying" the fabrics, colors, material combinations and labels. But if you want to spare those extra hours and do the same thing, but in a more comfortable way, you can google away everything that comes to your mind regarding bedding supplies. Look what I found from Inhabit. A wonderful woven damask texture, tone on tone with the perfect combination of shiny surfaces and tough materials. What is exceptional about this print is the fact that it can change its pattern depending on the room's lighting and angles of view. It is eco friendly, modern and minimalistic at the same time. 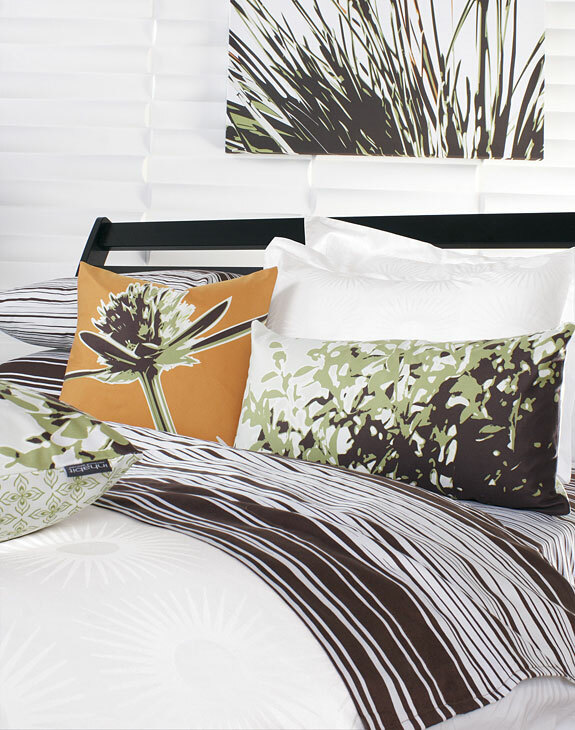 All cotton duvet covers are constructed with a button closure for easy removal and cleaning of the insert and duvet.